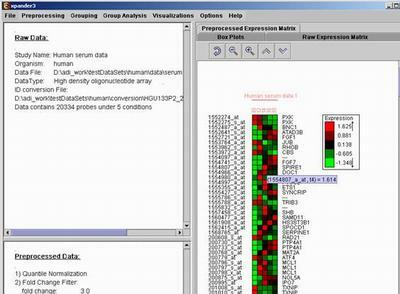 EXPANDER (EXpression Analyzer and DisplayER) is a java-based tool for analysis of gene expression data. It is capable of (1) clustering (2) visualizing (3) biclustering and (4) performing downstream analysis of clusters and biclusters such as functional enrichment and promoter analysis. In particular, it can analyze groups of genes for enrichment of transcription factor binding sites in their promoters.